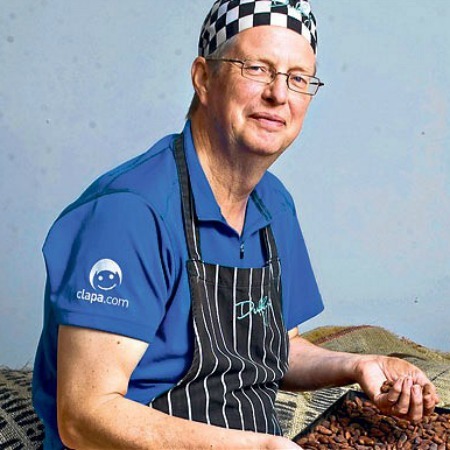 Duffy Sheardown is a pioneer in the craft fine chocolate movement in the UK. As a lifelong chocolate enthusiast, Duffy was intrigued to hear on BBC radio in 2007 that only Cadbury’s roasted their own beans. He left his career as a high tech engineer in Formula One racing to devote himself to learning how top quality chocolate is produced. A trip to the heart of Ecuador opened his eyes to the ancient secrets of cacao and introduced him to some of the world’s most flavourful beans. Back in the UK, he got some kit, set up his workshop, and started to craft some truly beautiful chocolate. Today, he is focused on working with farmers directly in Ecuador and Central America to make chocolate bars with unique flavour profiles that change from one year’s harvest to the next. What makes Duffy’s Chocolate great? Duffy’s is a trailblazer in chocolate and flavour craft, and the entire process, from roasting the beans to wrapping the bars, is done in-house. It’s a true bean-to-bar operation, and over the last 10 years Duffy’s has been hailed as one of the top makers in the UK. All of Duffy’s bars are carefully hand-wrapped in gold foil. Let’s cut to the chase: Pacari has won the most awards in the world for their excellent chocolate. All their bars are made from the distinctively fruity Arriba Nacional cacao bean, which is native to the region. This family-run Ecuadorian business make their chocolate in what they call a tree-to-bar process, with the entire operation happening right in Ecuador. They work closely with their farmers to treat the beans with extra care to bring out their best aromas. Aside from plain chocolate, they have developed some positively inspired flavour pairings, using the bounty of herbs, fruits, and spices of their beloved tropical country. Pacari brings a truly personal touch to the chocolate making process. They don’t just have a good relationship with their cacao suppliers; they are right there with them, working together to get the best from each harvest. Their chocolate is organically and vegan certified and treated with a gentle touch. The beans are only lightly roasted or “raw” (unroasted), to allow the rich flavours of Arriba Nacional to come through fully. A delight on the palate. 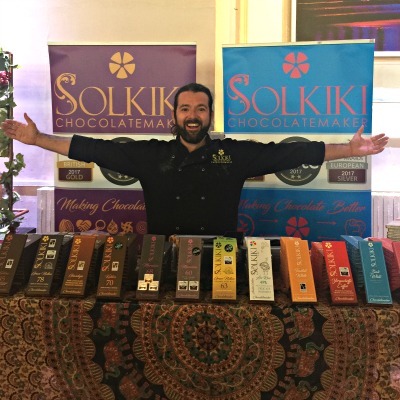 Solkiki began when Bob, Iris, and their small children decided to move to a old stone cottage in Dorset to dedicate themselves to their true calling—making amazing chocolate. While they are committed to discovering the most flavoursome cacao beans on the planet, what catapulted them into the chocolate limelight, so to speak, are their vegan principles. Both Bob and Iris are strict vegans, which inspired them to create milk chocolates with high quality plant milks such as coconut and non-GMO soy. They then developed an absolutely outstanding white chocolate bar, one of the best on the market, as well as some premier dark bars. 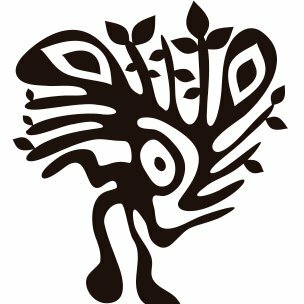 What makes Solkiki Chocolate great? Solkiki pride themselves on their ethical approach to chocolate making, which means they use only organically grown, whole ingredients (no texture stabilizers or artificial flavours). But it also means they have a great relationship with farmers, paying fair prices for top quality. And of course, they make the best vegan milk chocolate we know. With 35 awards in 2 years of trading, the results speak for themselves. 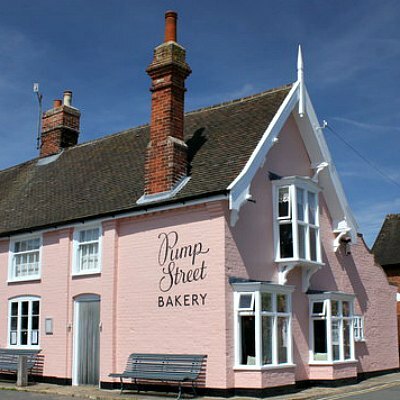 In the village of Orford in Suffolk, a pretty pink bakery is performing some rare alchemy behind the scenes. Skilled artisan bakers Chris Brennan and his daughter, Joanna have ingeniously combined some of the classic ingredients of breads—salt, sourdough, and rye—with exceptional single origin cacao from around the world. The results are positively magical, an absolute pleasure to experience. Aside from their bread-inspired flavoured bars, they also craft first-rate dark and milk chocolates, carefully packaged with batch numbers on the label. They have the art of baking is magically combined with passionate chocolate making. What could be better...the results are irresistable and a pleasure to experience. Besides the bread and chocolate combinations, they create award winning Chocolate bars, both dark and milk, carefully crafted and marked with their batch numbers on the packaging. Pump Street Chocolate is also remarkable in the way it is tempered and moulded- creating chocolate that is beautiful to look at and has the perfect sounding snap between the fingers..
What makes Pump Street Bakery great? Apart from their unforgettable flavour ideas, Pump Street Bakery uses a tempering and moulding technique that results in gorgeous bars of chocolate that give the most satisfying snap between the fingers. A truly unique chocolate making shop! Vincent Mourou and Samuel Maruta met when they were both on a holiday break in Vietnam, both needing a breather from hectic city careers. They made fast friends, and discovered a shared love for Vietnam’s land and culture, including and it’s forgotten cacao farms. Together, they made it their mission to craft remarkable chocolate using Vietnamese cacao, working closely with the local farmers. And Marou Chocolate was born. Their line of single origin chocolate bars from plantations throughout Vietnam illustrate the complexity and variation that come from soil and climate, even seasonal changes in weather. What makes Marou Faiseurs de Chocolat great? All of Marou chocolate is grown and made locally, and they are completely committed to promoting Vietnamese cacao farming’s spirit, culture, and industry. Every part of their product is evocative of the exotic, and respectful of the environment. aside from their superb taste, Marou chocolate bars are wrapped in the most beautiful, gold-embellished paper. Madagascar is a lush island nation off the coast of South East Africa, where, in the 1970s, the Akesson family purchased a large cacao farm in the Sambirano Valley. Today, Bertil Akesson manages the estate, growing Trinitario and rare Criollo cacao beans, before carefully fermenting and drying them onsite. Akesson’s sell the beans to independent craft chocolate makers, but Bertil’s personal passion is creating gorgeous chocolates from his own cacao. Akesson’s combines in-depth knowledge of cacao farming and flavour with a love of homegrown pepper, vanilla, and other spices to produce some truly astonishing single estate chocolates. What makes Akesson’s Organic great? Akesson’s Organic’s quality reflects a deep love of the land where the cacao is grown. A respect for terroir and a dedication to local ingredients gives them an intimate insight into flavour that few chocolate makers can match. Akesson’s is now also producing single estate chocolate from lands in Brazil and Bali.